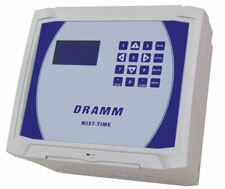 Manitowoc, WI- Dramm has updated the MistTime controller to be easier to program. With a new, text based interface, programming the MistTime is now as simple as answering basic questions. The dashboard shows active valves along with the actual time and the temperature (if enabled). All of the features of the MistTime have remained, allowing the user to increase misting frequency as the temperature increases. The last output may be used as a pump pre-start to increase pressure before any misting cycle and on-times may be as short as one second. However, the new unit also offers up to six program times per day. This allows the user to offer different misting cycles at different times of day. For example, between 8:00am and 10:00am, misting could be less frequent. Between 10:00am and 2:00pm, misting frequency could increase. From 2:00pm to 5:00pm it could decrease again and from 5:00pm to 8:00am it could operate on a minimal, night-time setting. The new MistTime is available with 10 outputs. Finally, the MistTime is built for durability with a NEMA4 rated sealed housing and includes sealed wire connectors. Contact Dramm with questions on the new MistTime.